“What do you mean? Everybody’s having a tough day. It’s how you show it that matters. So walk fast,” he replied. Actually, I ran. So, I considered the idea that without the discipline to demonstrate dignity, we don’t reflect honor and poise. But with that discipline, we can retain a level of respectability even if we’re struggling. See, I trust that my instructor’s reminder wasn’t just to berate me. It was that I needed to remain good-spirited in spite of how I was feeling. The alternative I had chosen, moping around and bemoaning my circumstances, doesn’t correspond to the tenets of martial arts practice. 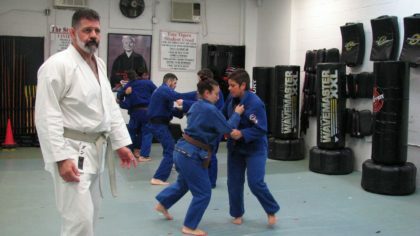 What I learned was this: discipline – as well as self-respect and self-esteem – has to be a regular mindset in martial arts. I don’t want to let someone inadvertently put me in a bad state or to have the power over me to steal my joy. It would mean that I’m not in control of my own emotions, that they are up for grabs. In the practice of Jiu-Jitsu, self-control is mandatory. That’s why in training if someone’s moving lazily or awkwardly, you can still fight the urge to respond with force. A good response is to rest in the gap between his or her movements and your intention, and that control preserves the dignity of the art. That’s why I’ll often tell students, “Don’t do ugly jiu-jitsu in front of me.” The ideal expression of the practice is to be calm, controlled and effective, all at the same time. If we can extend this routine into all areas of our lives – our friendships, interactions, and decisions – we can see big changes.